New research demonstrates that digital mammography plus tomosynthesis detects 90 percent more breast cancers than digital mammography alone. This higher detection may have a beneficial impact on cancer prognosis, according to the research appearing online in the journal Radiology. The new research represents a preliminary analysis from the Reggio Emilia Tomosynthesis trial (RETomo), a two-arm test-and-treat randomised trial comparing digital mammography plus digital breast tomosynthesis (DBT) versus digital mammography in screening. DBT is an imaging technology that uses a series of low-dose mammographic exposures to provide a 3D reconstruction of the breast. In studies comparing both technologies on the same women, DBT has proven to be more sensitive than digital mammography in detecting cancers. Despite DBT's superior sensitivity, some groups caution that it could detect cancers that will never be clinically relevant — a phenomenon known as overdiagnosis. Digital mammography plus DBT detected 8.6 cancers per 1,000 cases, a rate almost twice that of the 4.5 per 1,000 detected by mammography alone. The recall rate was 3.5 percent in both groups. DBT alone detected 72 of 80 cancers found in the DBT and digital mammography group. The greater detection rate for combined digital mammography and DBT was notable for small and medium invasive cancers, but not for large ones. Figure 1. Flowchart of recruitment phase and study design. In this article, we report data on the baseline end points, here shown in the upper dotted box. DBT = digital breast tomosynthesis, DCIS = ductal carcinoma in situ, DM = digital mammography. "Tomosynthesis and digital mammography is much more sensitive than digital mammography," said the study's principal investigator, Pierpaolo Pattacini, MD (pictured left), radiologist and director of the Radiology Department at AUSL Reggio Emilia in Reggio Emilia, Italy. "The vast majority of the advantage is due to tomosynthesis alone." While DBT's higher sensitivity would seem to make it a logical choice for breast cancer screening programmes, co-author Paolo Giorgi Rossi, PhD, director of the Epidemiology Unit at AUSL Reggio Emilia said that more research is needed to weigh the benefits of improvements in prognosis and reductions in breast cancer-related mortality from DBT against any undesired effects. "If these small cancers would never become life-threatening, then we are increasing overdiagnosis and not impacting mortality," he explained. "Thus, we need to have a measure of the impact of this higher detection rate on the incidence of advanced cancers and interval cancers in the following years." The additional reading time DBT would require from breast imagers is another aspect of the technology that requires consideration, according to Dr. Giorgi Rossi (pictured right), adding that screening programmes would require rethinking protocols and reading technologies to reduce or eliminate the extra costs. In an email to HealthManagement.org he explained that they are working on some modifications of the DBT workflow (only slabs, not slices) to make the reading quicker. "For the moment there are not easy solutions", he noted. Radiologists in the trial had about 1 year experience of DBT in assessment and in spontaneous screening, but no experience of reading DBT in organised screening, he explained. RETomo is a large study in which researchers will be looking at interval cancers, or those detected between screening exams, and cumulative incidence of advanced cancers. To have more precise and reliable estimates of these outcomes, the researchers are promoting a network of ongoing trials on tomosynthesis with similar study design across Europe. "Once we have this evidence, the consequences for screening could be even larger than a simple shift from digital mammography to tomosynthesis," Dr. Giorgi Rossi said. "For example, it could be appropriate to adopt longer intervals between screenings." Figure 2. Images in a 70-year-old woman in the digital breast tomosynthesis (DBT) plus digital mammography (DM) study arm. She had a breast density of Breast Imaging Reporting and Data System category C. A spiculated opacity is seen in the parenchyma of the upper-central quadrant of the right breast. A, D, Full-field DM (FFDM) obtained 2 years previously. B, E, Current FFDM images show only very fine converging speculation in the parenchyma. C, F, At DBT, the opacity with its irregular stellate margins is clearly visible. Both readers judged DBT alone and DBT+DM as showing positive results. Histologic examination after US-guided tru-cut biopsy and surgical specimen examination revealed invasive ductal carcinoma grade 2, luminal A, 15 mm. Figure 3. 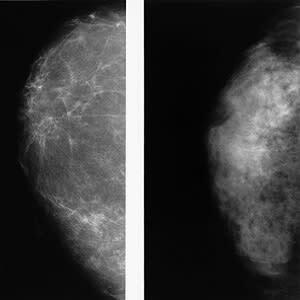 Images in a 66-year-old woman in the digital breast tomosynthesis (DBT) plus digital mammography (DM) study arm. 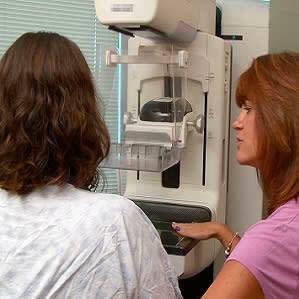 She had a breast density of Breast Imaging Reporting and Data System category A. A, D, Full-field DM (FFDM) obtained 2 years previously. B, E, Current FFDM images show the appearance of few heterogeneous coarse calcifications, clustered in a few millimeters, faint and difficult to see. C, F, At DBT, the cluster of microcalcifications is more clearly visible because of a higher contrast with the surrounding fat tissue. Both readers judged the DBT-alone images as negative, and both judged the DBT+DM images as positive when compared with previous DM images. Histologic examination after stereotactic biopsy and surgical specimen examination revealed ductal carcinoma in situ, intermediate grade, 8 mm.